We’d love your help. Let us know what’s wrong with this preview of Hannah-Beast by Jennifer McMahon. The fate of a lonely girl becomes part of a town’s shameful secret history in Thriller Award winner Jennifer McMahon’s terrifying story of guilt, retribution, and one tragic Halloween night. Thirty-four years ago, on October 31, poor Hannah Talbott took part in a scavenger hunt gone violently wrong. The mean girls made sure of it. To this day, for a haunted local mother, th The fate of a lonely girl becomes part of a town’s shameful secret history in Thriller Award winner Jennifer McMahon’s terrifying story of guilt, retribution, and one tragic Halloween night. Thirty-four years ago, on October 31, poor Hannah Talbott took part in a scavenger hunt gone violently wrong. The mean girls made sure of it. To this day, for a haunted local mother, the most unsettling Halloween costume of all is an urban legend they call Hannah-Beast. It’s a reminder of the past she can’t forget. Especially tonight when it’s come back, so close to home. To ask other readers questions about Hannah-Beast, please sign up. 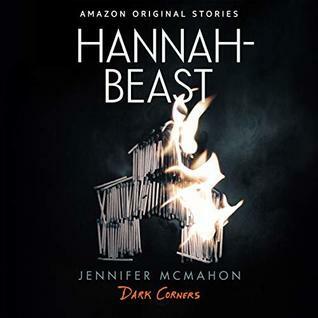 Hannah-Beast(Dark Corners collection) by Jennifer McMahon is a Halloween tale highlighting the perils of complicity. What goes around comes around! 3.5 I love Jennifer McMahon, her books are always different, surprising, she takes risks in her fiction, which I admire. Plus, this was an Amazon narrated prime freebie, so I couldn't resist. First scary book I have listened to, and the you g girls voices in this I find hard to forget. "Say Boo! Hannah beast" "We love you Hannah Beast." Oh, the cruelty of young girls. So this seriously creeped me out and the very unexpected end was horrible but apropos. In 2016, Amanda is at loggerheads with her 13-year-old daughter Erin, who wants to dress as 'Hannah-beast' – apparently a local custom – for Halloween. In flashbacks, we learn where the story came from: Halloween 1982, with a group of bullies (of which Amanda was part, though she pretends otherwise to Erin) creating an inventive form of torment for their favourite target, an innocent and trusting girl called Hannah. While the prank is mean-spirited, they don't intend to cause real harm, but things get out of hand and the night ends in tragedy. In subsequent years, 'Hannah-beast' becomes something of a town legend, a spooky story passed among kids who don Hannah's mismatched costume of clown wig, feather boa and blue face paint for Halloween. I have no hesitation in saying Hannah-Beast is the best of the Dark Corners bunch. McMahon does a great job of swiftly rounding out her characters and making the reader sympathise with the bullies – who are young, and stupid, and don't mean for things to go as far as they do – as well as the victim. The story has a superbly creepy-cosy atmosphere, conjuring up the sinister magic of the season; exactly the sort of thing I crave at this time of year. The plot is straight out of a good horror anthology film (it would fit right into Trick 'r Treat). A perfect autumn indulgence. Hannah-Beast is the first story in the Dark Corners Collection, a collection of seven short stories offered up as Amazon/Audible Original content. I love listening to original horror stories on audio, so I jumped right on this collection! Glad I did -- each story is creative and different. They say that urban legends and myths are based in fact. In this short story (I lean more towards novella really as the audio version of the story is just over an hour long....a bit lengthy for a short story), Hannah-Beast is the first story in the Dark Corners Collection, a collection of seven short stories offered up as Amazon/Audible Original content. I love listening to original horror stories on audio, so I jumped right on this collection! Glad I did -- each story is creative and different. They say that urban legends and myths are based in fact. In this short story (I lean more towards novella really as the audio version of the story is just over an hour long....a bit lengthy for a short story), a town's legend about a young girl who once went crazy while trick-or-treating turns out to be more truth than legend. Many, many kids dress up as the Hannah-Beast and the legendary figure is even hanged in effigy in the public park each year. But one woman knows the truth.....and it's going to come back around in a predictable but gruesome way. While similar stories have been told before, I liked how this one is told in present time and in flashbacks. The story is a mix of horror and morality tale. Secrets and lies never really go away.....they come back around when least expected. No escaping karma. I wasn't surprised at the ending, but this was still an enjoyable listening experience. I longed to tell two characters in this story that under no circumstances should you ever, ever, ever trust the mean girls. Never. Not ever. There are seven stories in the Dark Corners Collection. This is the first one I have listened to. I'm definitely going to listen to the rest. I'm reviewing them separately because they are all by different authors that are new to me. Jennifer McMahon is the author of several other creepy stories....after enjoying this one I'm definitely going to read more by her. She has also narrated several audio books including Haunted Ground by Erin Hart. The audio book version of this story is narrated by Amy Landon and runs just under 1.5 hours. Landon reads at a nice pace. At first, I thought her performance was a bit wooden...but her voice and delivery grew on me as the story progressed. Her tone made more sense as I came to know the main character a bit better. All in all, not really very scary or creepy, but a nice listening experience. A good short story for spooky October. This was a pretty good one. I think it's my first story by Jennifer McMahon. Centered around a horrible event that happens in the main character's childhood on Halloween night, it flashes back and forth between past and present. As you learn what happened in the past, the tension builds fairly effectively. I felt sorry for the bullied girl in the flashbacks. She was definitely naive, but children can be so cruel that it wasn't completely unbelievable either. The ending was a decent one as well. Not This was a pretty good one. I think it's my first story by Jennifer McMahon. The ending was a decent one as well. Not really shocking, but still horrifying. It's short. It's creepy. It's free. Stuff is set on fire. Things (pumpkins) are stabbed. Kids are assholes. *or don't I mean I liked it but I have terrible taste and low self esteem and you probably should just go because this review is all downhere from here. This was very spooky, perfect for October! Halloween is optional. This story makes no sense. Why on earth would the mom even “celebrate” Halloween after what happened in 1982? Why wouldn’t she just say “that girl was my friend and it’s not okay to dress up like that on Halloween.” Best quote “It was after six, already full dark.” Full Dark. You should definitely check this out if you like creepy, freaky, odd, scary or even strange dark fiction. This is a perfect (very short) Halloween shortie. I was shocked by how the story ended for 2 people (kinda 3)! Read it or listen for free on KU. I think listening is most likely the best way to experience Hannah Beast. I liked this short story from Jennifer McMahon a lot. I didn't see the end coming at all, it gave me goosebumps. Perfect for Halloween! You know that something is coming but it still gets you. Wow. This was an excellent short story. Building an atmosphere and characters that you care about. It scared me and made me immensely sad at the same time. Looking for more by this author now. Great short story, perfect for Halloween! Side note- the narrator's voice drove me insane, but other than that, a solid story. Short fiction is so difficult to pull off effectively, especially horror fiction. Jennifer McMahon is one of my favorite literary horror novelists. I love her understated, quiet way of slow-moving, inevitable dread. Because this is short, straight-up horror, that slow building tension is lost and the whole thing rushes forward with no real surprises. Four stars for being a well-written, believable account of the origin story of a Halloween urban legend. A note on the publishing: kudos to Amazon for Short fiction is so difficult to pull off effectively, especially horror fiction. A note on the publishing: kudos to Amazon for moving into private publication with this and other series, making them available at low cost or free with Kindle Unlimited. My only complaint with this one is the use of key phrases, printed boldly in the storyline, such as is done in magazine or newspaper articles. The phrases in this case are not overly indicative of key or salient points but merely serve to lengthen the product and are jarring to a smooth reading experience. Just my thoughts. I found this story to be fairly boring. It didn't really keep my attention. This may be a short story but it had my heart pounding and left me shaking my head, stunned. Jennifer McMahon is a master storyteller. Her prose is gripping and fear inducing. Wow. This was a dark creepy story that made for a perfect Halloween read. While it was sad at times, that added to the horror and the overall feeling of dread that grew and grew as the story went along. Great ghost story that was familiar yet fresh at the same time. This is a short story where things aren't what they seem. Where a childish prank turns ghastly and haunts those involved well into adult hood. Super scary? No. Held my attention for the 49 pages? Yes. I'm hoping for a story in this collection to scare me, but this one didn't. It was just sad and cruel, and I felt that Hannah's last chapter was in poor, poor taste. And I thought Amanda was so stupid about everything. That would not have happened at the end if she had just told the goddamned truth (but bonus points for it shocking me). I liked the time jumps, they helped build some tension between the two stories. Of course her daughter dressed up as Hannah, that was so plain to anyone who's ever been told by their parent to not do something and then immediately did it when they were out of sight. Actually not a story about a haunting, just a story about a person who suddenly (and inexplicably, if you think about the fact she's only now thinking about that night but then it's a narrative so that's how it has to come together) I liked the time jumps, they helped build some tension between the two stories. Of course her daughter dressed up as Hannah, that was so plain to anyone who's ever been told by their parent to not do something and then immediately did it when they were out of sight. Actually not a story about a haunting, just a story about a person who suddenly (and inexplicably, if you think about the fact she's only now thinking about that night but then it's a narrative so that's how it has to come together) thinking about her childhood friend. She gets drunk and her imagination gets the better of her and she ends up killing the ghost she imagined. Whoops. Creepy would be the way that the girls are basically little shits who didn't even care they killed two little boys. It's even brought up in a throwaway line about the grown-up version of the girls. There's no indication other than "I hate Halloween" from the mother that she stresses over the guilt. Oh no, that's terrible. You hate Halloween? That's all? are u a scary story halloween fan? Oh my goodness, what a great idea ...from the 7 books the ones I did enjoy the best were "The Sleep Tight Motel" 1st & "Hannah-Beast" 2nd, if you know anything about Beth... I love mysteries ...but I don't really enjoy the scary parts. I love parts of Halloween. but the happy scary part. I think my understanding of these stories were meant to be short and quick ... maybe to get you hooked to read more from the author of you so desire?! Well, I thought this was pretty good for a short which I don't usually read I like my books to be like an Everlasting Gobstopper. This was about a Mom who with her friends did a very very horrible bullying type of thing when they were younger on Halloween. Innocent kids were murdered. Basically, she what she did came back to haunt her and not in a good way. Looking to get into Halloween mood? This SS is part of Amazon's Dark Corners collection. All 7 shorts (each w/ with audio) are available via Kindle Limited. Part of Amazon's Dark Corners Collection. This is more a sad story than a scary one. It does make me wonder what the other "mean girls" from 30 years ago are doing now. Mel seemed like a psychopath. This story unfolds quickly but provided enough suspense to hold me until the end! The character development was good, I felt so sorry for poor Hannah! Another great read provided by my Kindle Unlimited subscription. Creepy and chilling Halloween read!! I'm the author of seven suspense novels, including Promise Not to Telll, The Winter People, and most recently, The Night Sister . I live in central Vermont with my partner and daughter, in an old Victorian that some neighbors call The Addams Family house.